The trailhead has moved slightly since this was posted in 2001. Only the first quarter mile of the hike has changed. All the good stuff remains the same. Download the official route for best results. 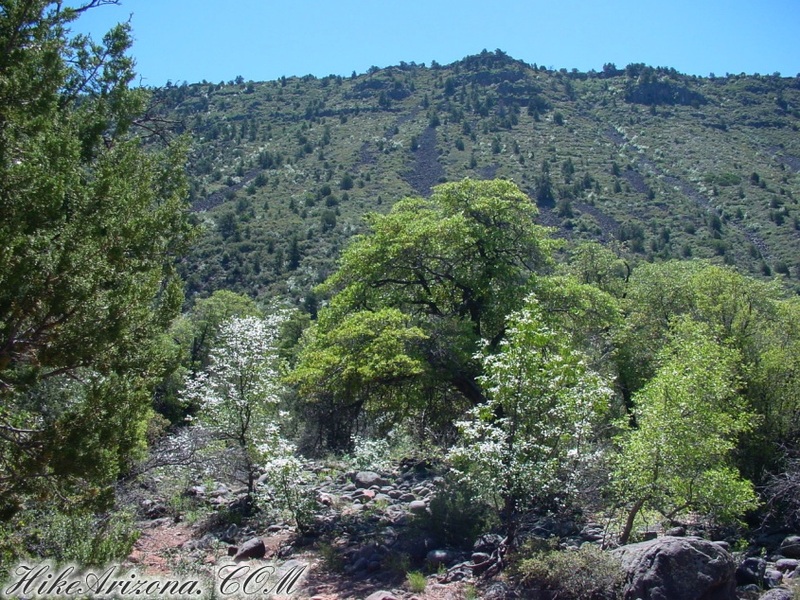 Woods Canyon is located southeast of Sedona. The canyon is protected by the Munds Mountain Wilderness (sorry mountain bikers). The canyon begins to etch the surface up near mile marker 316 on I-17 at (you guessed it) the Woods Canyon bridge. From I-17 it slowly snakes out to the west. Then in about 2 miles it opens up and rips it's way down to SR179 below the Village of Oak Creek. This page is dedicated to an out and back hike from SR179 to just past what I call "Red Rock Beach". From the trailhead you head out on a now closed jeep route. Thankfully, the recently closed route is already becoming less noticeable due to the wet winter of 2000. Tall grasses lining the trail attract a never ending grasshopper invasion. Since it's only for a short distance it didn't bother me. It's also unlikely this occurs most of the year. The trail crosses a relatively flat meadow working it's way towards Woods Canyon. Across the way you'll see the Beaverhead. I'm not sure why it's called that. That's just how it's labeled on the topographical map. Knowing Wet Beaver Creek is near by I'm sure it's related. My best theory so far is the terrain of the area resembles a beaver when viewed on a topographical map. Perhaps someone will fill me in on the whole story someday. The trail stays to the left of the creek. Views of the creek aren't great. There's no need to be disappointed. The trail is remarkably well placed in the foliage of the canyons namesake. By the way, the creek is seasonal. I've read and been told by friends this trail is much better when the creek is flowing. I did enjoy the sound of the flow. Though it didn't seem to be the highlight of this experience. I hiked on figuring some spectacular view must be further on. The opposing canyon wall offers some great views. The steep slope is amazingly wooded. Rock slides patched along the wall reassure you it's very steep. At two miles is the junction with the Hot Loop Trail. The Hot Loop jets up onto Horse Mesa. Horse Mesa makes up the canyon wall on your left. Continuing on past the junction there are some views of the creek below. The trail skirts the left wall of the canyon above the creek. Along the way you see Rattlesnake Canyon forking off to the right. About a mile and quarter from the Hot Loop junction the trail finally goes down to the creek. The hike was nice up to this point. I soon found out why everybody recommends hiking this trail when the creek is flowing. Welcome to Red Rock Beach! Sedona red rock sandstone lines the left bank of the creek. Smooth water-flow-paths etched into the slab are cool to observe. The pool gathered in the area wasn't deep enough for swimming on this day. Like similar oasis, the water level drops by the time it's hot enough to enjoy. 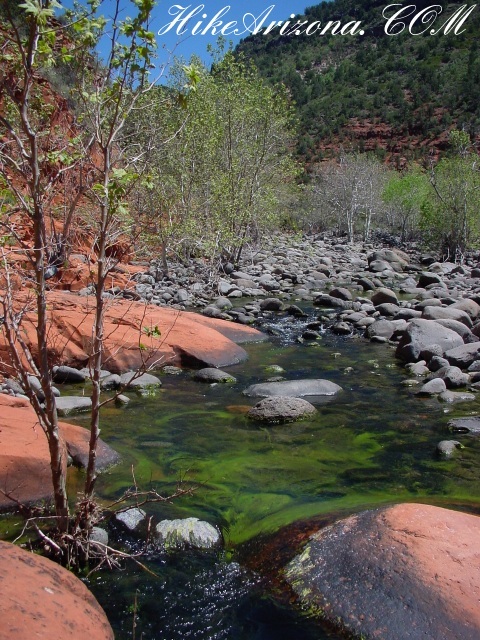 The most spectacular sight was the fluorescent algae algae seen against the red rock. 3.4mi here is the end of this description. Further on to the end of the trail at 5.25mi is not exciting for most casual hikers. Rattlesnake Canyon on the right is a three mile excursion. There's no trail connecting. A big waterfall 2.5 miles in might be to your liking. 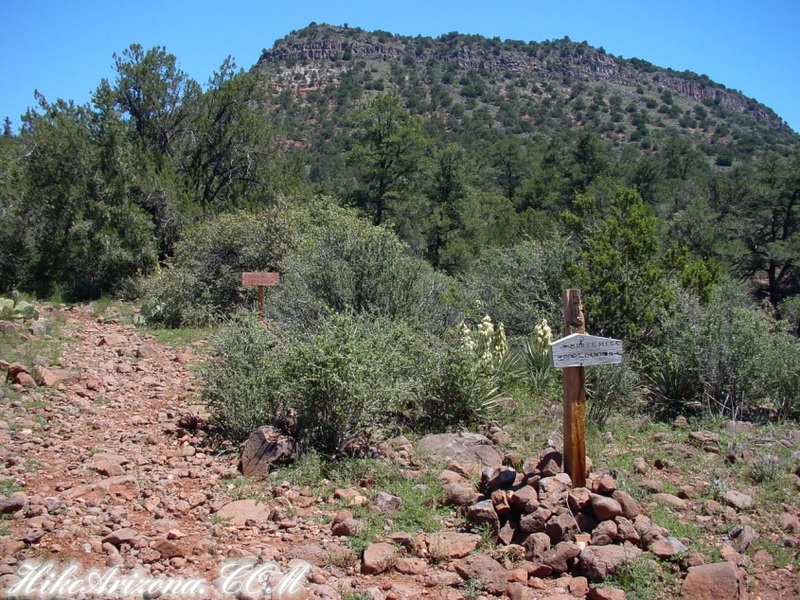 Coconino FS Reports The trail begins at the signed trailhead beyond the gate. It is level and unshaded as it follows a jeep road into the wide canyon mouth for 1-1/4 miles. The road ends and the trail continues, climbing gradually. 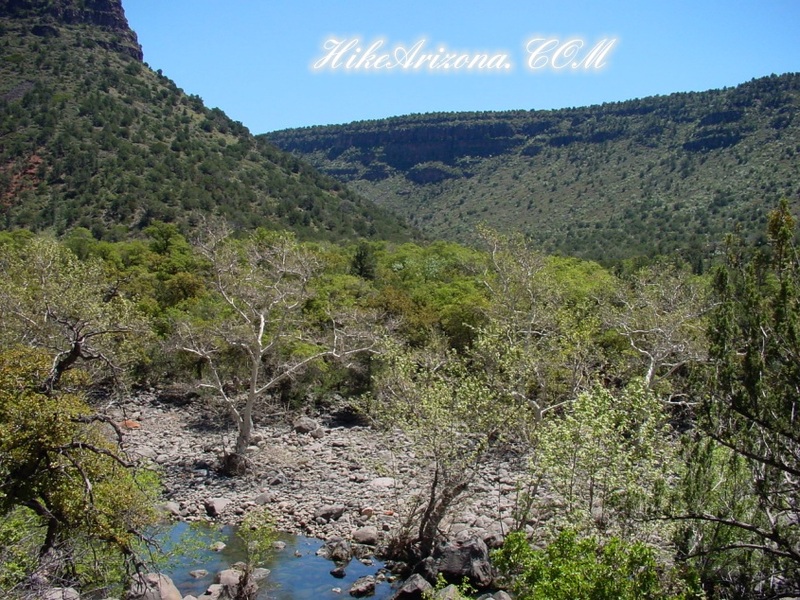 There are views of the vegetation-covered slopes of mesas on either side. 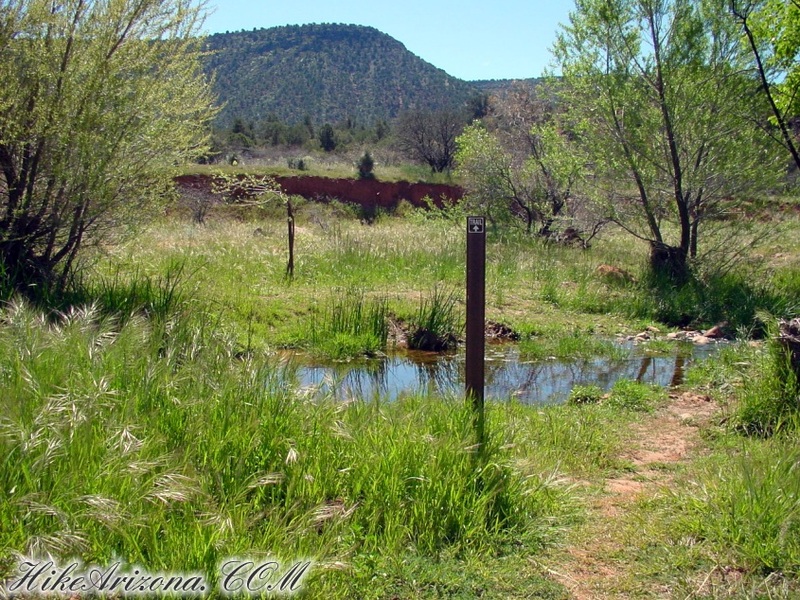 At 2 miles, the trail crosses a small, dry streambed with red rock pools, climbs out, passes through a cattle gate, and comes to a signed fork. 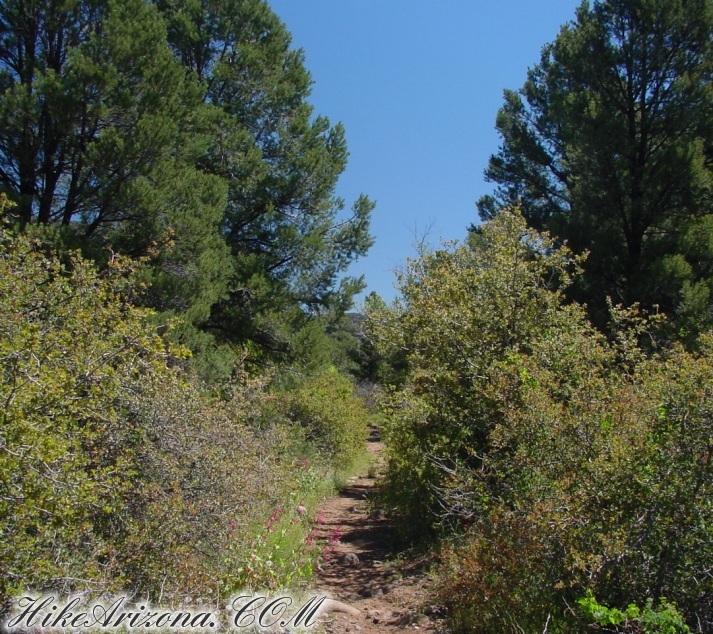 The Hot Loop trail enters Wilderness area and continues its easy climb, passing some redrock formations on the left. It enters the occasional shade of pine and sycamore as it approaches and then follows Dry Beaver Creek. At 3-1/2 miles, the trail emerges on a picturesque expanse of redrock at the edge of the usually dry creekbed which is studded with huge, gray boulders. Continue on for another 3/4 mile for some nice redrock views as the trail climbs on a moderate grade out of the creekbed. This is a good place to turn around although a path continues further into the canyon. Return by the same route. This hike can be hot in summer. Red Rock Pass - may or may not be required. Go to Red Rock Pass then check "When is a Red Rock Pass Required?". 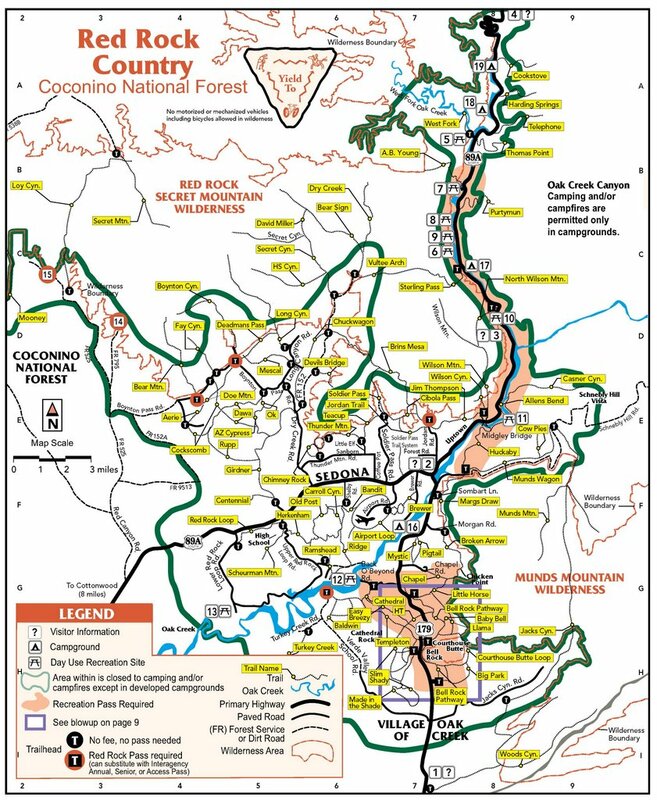 If you have questions contact the Coconino forest service. From I-17 turn left onto AZ-179 and follow 5.8 miles west. The trailhead shares parking with the Red Rock Ranger District station. 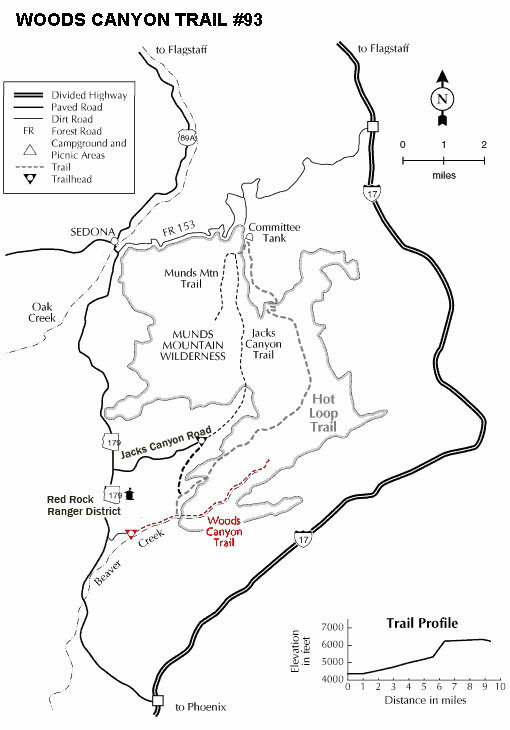 From the Junction of US 89A and 179 in Sedona, head south on 179 and drive about 8.4 miles to a gated, unpaved road on the left (east) at milepost 304.7. Park outside the gate. For historical purposes these were the old directions before the trailhead was moved... From Phoenix head north on I-17 to EXIT 298 (the Sedona exit) Go east towards Sedona for about 5.5 miles to mile marker 304.8 (if you pass 305 you just missed it) There's a popular wide apron on the right where tourist take photos of the red rock. You won't be parking here, look for the road with the gate. There's a steel sign on the left etched 'Woods Canyon 93'. This isn't the trailhead, drive through the gate (be sure to close it too) It's a short tenth of a mile to the trailhead. Any car should be fine on this road.